Just when we thought we’d seen everything novel and eclectic when it comes to cheese sold at Aldi — from the Valentine’s Day heart-shaped cheese assortment to the cheese Advent calendar — the discount grocer has surprised us again with an ’80s Smash Hits Cheese Assortment. The Happy Farms Preferred ’80s Smash Hits Cheese Assortment hits stores February 6, 2019, and it gets kudos for creativity. 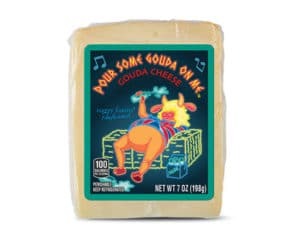 Priced at $3.49 each for packages ranging 5 to 7 oz., the assortment consists of six cheese flavors with names that are parodies of popular song titles from the 1980s. These cheeses are ALDI Finds (Special Buys), so stores will have a limited supply, and once they’re gone, they’re gone. Wake Me Up Before You Goat Goat. This consists of five individually packaged 1-oz. 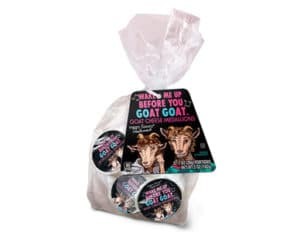 goat cheese medallions packed in a bag with cartoon goat figures. It’s a parody of the song title Wake Me Up Before You Go-Go by the British duo Wham! 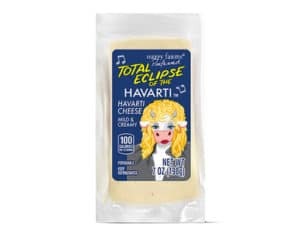 Total Eclipse of the Havarti. This is a “mild and creamy” havarti cheese in a 7-oz. package that nets you 100 calories per serving. It’s a parody of the song title Total Eclipse of the Heart by Welsh singer Bonnie Tyler. Pour Some Gouda on Me. This is a 7-oz. package of gouda cheese with 100 calories per serving. It’s a parody of the song title Pour Some Sugar on Me by the English rock band Def Leppard. Sweet Cheddar of Mine. This is a 7-oz. block of cheddar cheese that has 110 calories per serving. It parodies the song Sweet Child O’Mine by Guns N’ Roses. The milk for this cheese comes from the Isle of Man. Girls Just Wanna Have Fontina. This 5-oz. block of cheese is a combination of goat cheddar cheese and mild cheddar, with 110 calories per serving. It’s a parody of the song title Girls Just Wanna Have Fun by Cyndi Lauper. Billie Goat is My Lover. This 7-oz. package of cheese has 130 calories per serving and is a goat-milk cheddar cheese. It’s a parody of the song title Billie Jean by Michael Jackson. One thing is certain: Aldi has upped its cheese game during the past few months, bringing out specialty high-interest cheese and cheese products for specific holidays or, in this instance, just because. We’re looking forward to seeing what more Aldi has up its sleeve in the cheese department. In the meantime, enjoy these upcoming cheeses while humming along to some classic ’80s hits. If you pick up any of these cheeses in Aldi stores next week, let us know what you think of them in the comments.